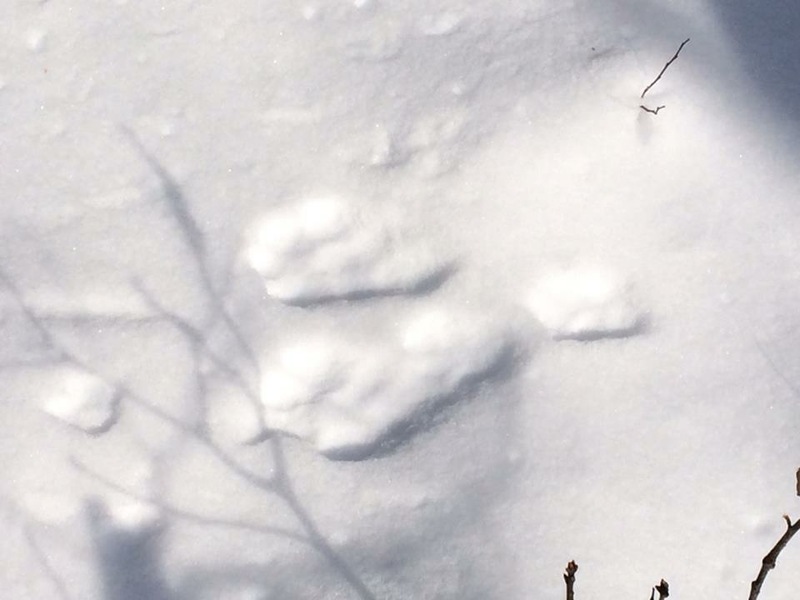 Have you ever come across animal tracks in fresh snow? Deciphering the mystery of what types of animals inhabit the places we visit can be a fascinating, and relatively simple task if you have some basic knowledge of animal gaits and patterns. First, it is important to keep in mind that snow conditions can make a significant difference in the way that a track looks. For example, a print may appear quite clear in wet snow, whereas prints in drier, powder-like snow may be harder to analyze because they are not as clearly defined. The next step is to think critically about the gait of the animal; the manner in which it walks or moves. There are four types of gaits that most animals employ throughout their daily (and in many cases, nightly) activities. The first type of gait is the most common – the walk. Animal tracks left behind by a walk show alternating evenly spaced prints in parallel rows with a short stride and wide straddle. The second type of gait is the trot. When an animal is trotting, each hind foot moves at the same time as the opposite front foot. As the animal’s speed increases, the prints are spaced farther and farther apart. Next, we have the gallop, which is the swiftest form of movement for a mammal. Because an animal must expend a significant amount of energy to gallop, it usually won’t employ this method of movement for very long unless it is being chased by a predator. The straddle of a gallop is much smaller than that of a trot or a walk. Lastly, jumping is the most energy consuming gait. During jumping, there is at least one stage where all four feet leave the ground entirely. Examples of jumping animals include squirrels and rabbits. 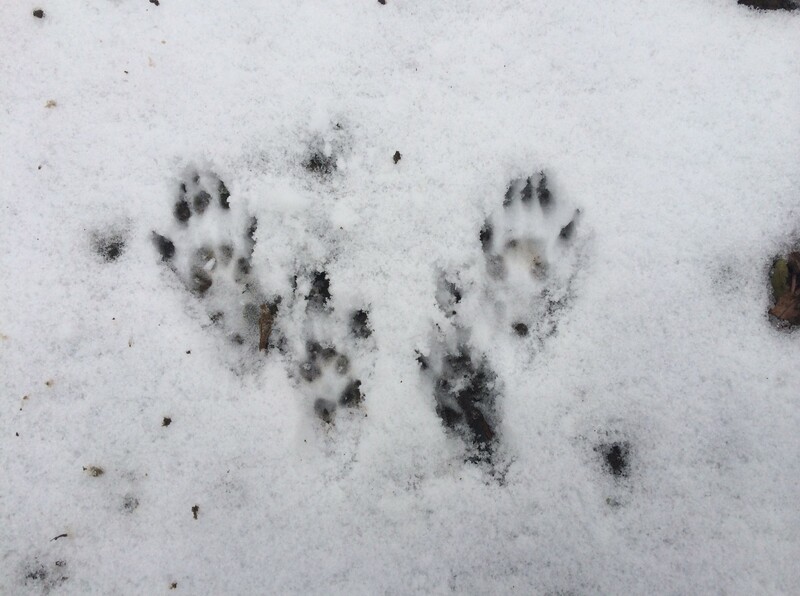 Above: Squirrel tracks feature four toes on the front feet and five on the back, with claws visible. When squirrels run, their back feet land in front of their front feet, so this track is evidence that this squirrel was running. This print was left in shallow wet snow, hence the distinct print outline. Above: Snowshoe hare tracks have a clear Y-shaped pattern because the back feet always land in front of the front feet and are 2-4 times longer. This print was left in deep powder-like snow, making it more difficult to identify. Snowshoe hare have large feet proportionate to their body size so that they do not sink into the snow, hence their name. 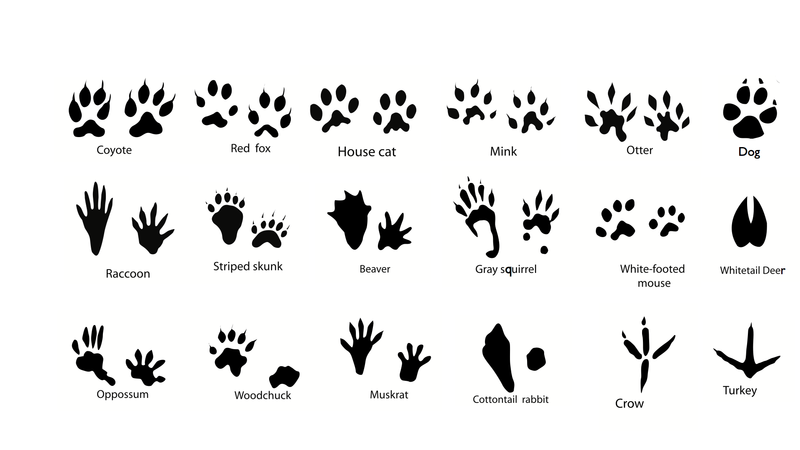 In addition to determining the gait of the animal whose print you are examining, the shape of the track helps to identify what family or group of critter you are dealing with. For example, tracks from animals in the cat family are roundish and show four toes on both the back and front feet. You won’t see any claw marks on cat prints because cats walk with their claws retracted. Members of the dog family (coyotes and foxes) leave prints with four toes showing on both the back and front feet. You can distinguish these prints from those of the cat family because the print is less rounded, and claw prints are typically visible. Deer tracks are prevalent throughout the state and are easy to identify. These prints are heart-shaped with a line down the middle. Moose tracks are similar in appearance; however they are considerably larger in size. Tracks from members of the rodent family as well as the weasel family can vary widely. Reference the key below for help with these types of tracks. Above: Key for identifying animal tracks. These are just some of the tracks you may encounter in New York State Parks and Historic Sites. 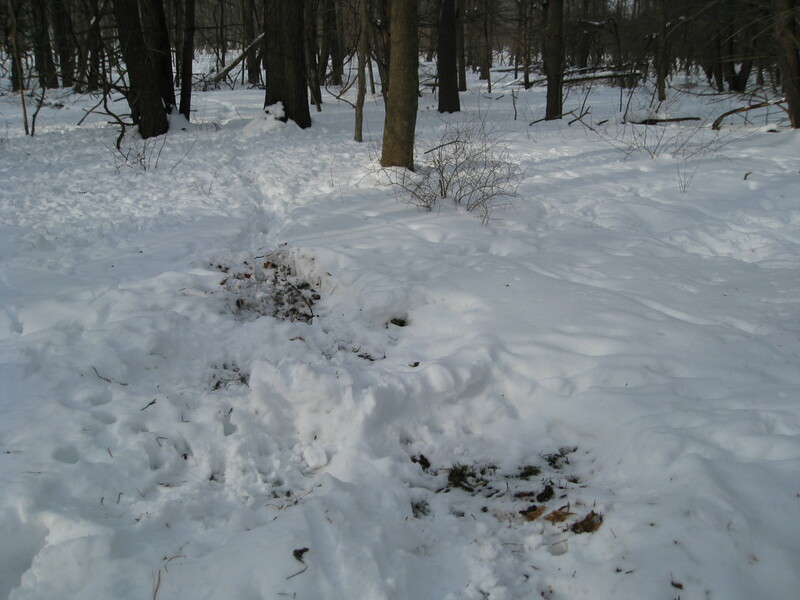 Above: This is a deer trail through the woods. The area with exposed leaves is evidence of foraging activity, where the animal was likely in search of acorns, beech nuts or evergreen foliage to feed on. Information sourced from the New York State Conservationist (February 2001). Post by Megan Phillips, photos by Lilly Schelling (OPRHP).